You thought it was over, but you couldn’t be more wrong: Dr. Who is back! And yes, I mean “Dr.”, not “Doctor”. Today we’re looking at the second of two “Dr. 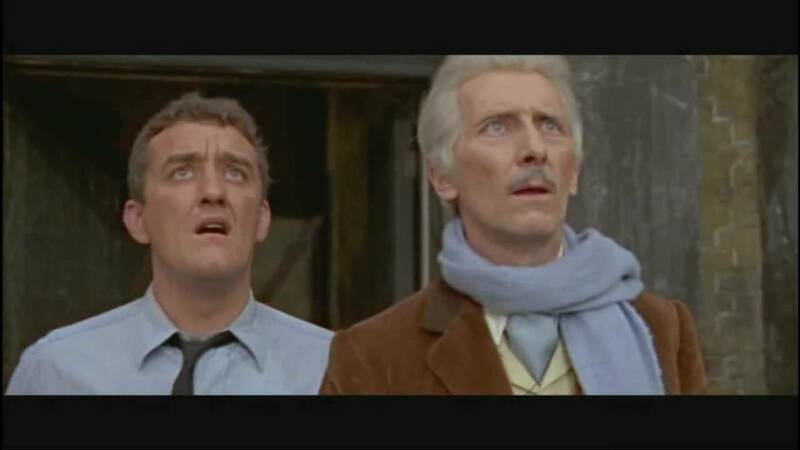 Who” feature films, Daleks’ Invasion Earth 2150 A.D., featuring Peter Cushing as Dr. Who! Let’s get started! 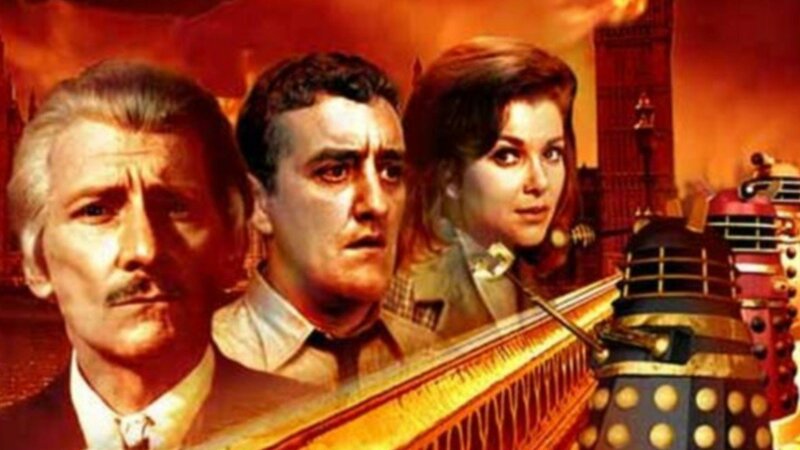 Previously I reviewed the first movie in the series, Dr. Who and the Daleks, based on the 1963-1964 television serial, The Daleks. You can find my review here. That film, released in 1965, saw Doctor Who adapted for the big screen, and featured Peter Cushing in the title role as the slightly-mad scientist Dr. Who (Who being his actual surname, as he is human, not alien). He was the inventor of a time-space ship in the shape of a police box, called Tardis (no acronym), and was accompanied by his granddaughters Susan and Barbara, as well as Barbara’s somewhat incompetent boyfriend Ian, to the planet Skaro, where he met the Daleks. Taken captive, he and his companions are forced to overcome their captors and aid the native Thals in overthrowing them for good. It’s an odd mirror of the television series; as it was intended to be a series of movies, with less time for backstory, there is none of the embryonic lore that was even then present in the television series. I had commented that it fit in well with the Disney live-action movies of the day, and I still think so; that doesn’t make it bad, but it is certainly different from its television progenitor. The following year, this sequel, Daleks’ Invasion Earth 2150 A.D., was released, based on the serial titled The Dalek Invasion of Earth. That serial was a bit shorter than the original (six episodes instead of seven), and a bit faster-paced; it showed a slightly more advanced breed of Daleks, as they no longer require the transmission of electricity through the floor; in fact, they can function while fully submerged in water. This upgrade is also seen in the film version; the sight of the Dalek rising from the river remains one of the most dramatic moments in early series history. Rumors have persisted for years that a third Dalek movie was planned, based on The Chase, but if so, it was never produced. Things have changed a bit this time. 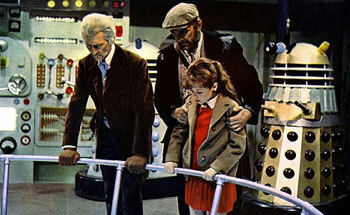 Ian and Barbara are no longer present (coincidentally, by the time the movie was released, their television counterparts had left the Doctor and returned home); they are replaced by Dr. Who’s niece Louise, and Tom Campbell, a policeman with the misfortune of wandering into Tardis while dealing with a burglary. Modern Whovians will recognize Tom: He’s played by a young Bernard Cribbins, who would much later play Donna Noble’s wonderfully worrisome grandfather, Wilfred Mott. While the Doctor doesn’t exactly kidnap Tom willfully, the effect is the same; he leaves with Tom aboard so as to avoid being caught in the middle of the events outside. Much more politely than the television Doctor, he later puts Tom back right where he found him—or earlier, actually, allowing him to anticipate the burglary. No Thals are present this time around; we stay on Earth for the duration, but we do leap forward to—as the title says—the year 2150 A.D. 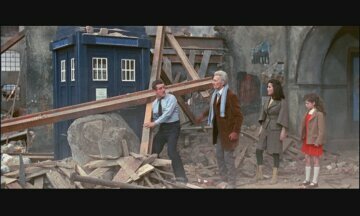 The plot isn’t too dissimilar to the television version: Tardis is immediately blocked off by a pile of rubble, and its crew fall in with, alternately, the human resistance and the Daleks’ mind-controlled Robomen. After quite a bit of back and forth, and a scene where the Doctor and Tom are nearly made into Robomen themselves, the group ends up at a mine where the Daleks are attempting something ambitious: They want to destroy and remove the Earth’s metallic core, and install machinery that will allow them to pilot the planet through the cosmos, giving them a mobile base for their war of conquest. It varies a little from the television version, in that the Daleks there are defeated simply by the explosion at the mine (presumably leaving other Dalek cells around the world to be dealt with), whereas here they are destroyed by the Earth’s magnetism when the bomb is detonated out of place. This version is less plausible, of course, but it makes for some interesting visuals onscreen, as Daleks are pulled in and crushed like aluminum cans. The Dalek Invasion of Earth had the distinction of being the first time in the series’ history that a main cast member left the show, as Susan left the TARDIS, or rather, was left behind by the Doctor. It’s a great scene, giving us his famous “one day I shall come back” speech. In this version, Susan looks to be about twelve at most, and there’s none of that. Really, she’s a bit unnecessary throughout the movie; but then, so is Barbara—the bulk of the action is carried out by the resistance fighters and Tom. Even the Doctor seems almost to be making a cameo in his own film; he’s definitely less involved here than he was in the previous film. None of that is to say that the movie is bad or unenjoyable; it wasn’t uncommon in the First Doctor era for him to be less involved than his companions, as they serve as audience surrogates. Once again, we get the same colorful and explosive (literally) visuals as the first film; the Daleks, again, are clearly ranked by color. They differ from their small-screen counterparts in that they don’t fire bullets or lasers, but rather, a gas weapon of some sort. Everything is a bit bigger here, and that’s understandable. The Daleks still are susceptible to being literally pushed around, unfortunately; while I think this version are a bit more menacing than the television version of the era, it breaks the immersion completely to see them blow up upon being shoved down a ramp by a bunch of humans. If it was that easy, then how did they conquer anything in the first place? This movie assumes you’ve seen the first one. It does give some hasty explanation of what’s going on—the nature of Tardis, especially, plus a brief recap of the first film—but it’s very rushed and short on detail. There are references to things such as the Daleks’ previous dependence on electricity, but there’s little explanation. So, what did I think? Last time, I spoke a bit about the nature of canon, and whether this film can count as canon. I won’t get into that again; my argument there applies here as well. My impression of the movie is that, like its predecessor, it’s a lot of fun to watch—assuming, that is, that you go into it with an open mind. It’s not Doctor Who, and it never will be. It isn’t supposed to be. It’s Dr. Who—and it stands well on its own two feet. It’s very dated, of course, but then, it should be. It’s free of the difficulties that the series often faces with regard to its nature—is it a family show? Is it more for adults? What’s appropriate to show? This is a movie you’d watch with your children and not think twice. At the same time, it’s still based on Doctor Who, and still grapples with the same concepts of time, change, justice, hope, desperation—those things never change, and they’ll always be worth our time. High entertainment? No. Still worth it? Totally. So, take a break from saving the universe. It’ll still be there. Series Ten is a long way away. Sit back, grab a drink, and watch some Daleks get shoved around. Have some fun with this film—let the television series be serious. Spend a few hours with Dr. Who. You might be entertained, but you won’t be disappointed. Note: Unfortunately I was unable to locate streaming sources for Dr. Who and the Daleks or Daleks’ Invasion Earth 2150 A.D., however both are available for purchase on DVD from Amazon.com, bundled together as The Dalek Collection. And now for something completely different! Or at least, a little different. I’m taking a brief break from my Classic Doctor Who rewatch today, and talking about something related: the 1965 theatrical release, Dr. Who and the Daleks! Wanting to expand the Doctor Who brand (and of course make more money, though that’s understandable), in 1965 the BBC and Terry Nation, the creator of the Daleks, struck a deal with Amicus Productions (by way of AARU) to bring the Doctor and the Daleks to the big screen. It seems hokey now, but at that time it was a big deal: The already-popular series would get an adaptation with wider reach, and—revolutionary!—in color! Technicolor, to be exact. 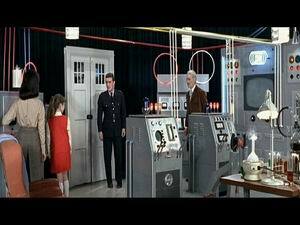 The film, titled Dr. Who and the Daleks, was released in June 1965 in the UK (1966 in the US), and starred Peter Cushing as the Doctor. Loosely based on the Daleks’ first appearance in the TV series (1963-64’s The Daleks), it was the first of two such films, followed by Daleks: Invasion Earth—2150 AD (based on The Dalek Invasion of Earth). Rumors have persisted for years that a third film was to be produced, possibly based on The Chase, the serial that saw the departure of Ian Chesterton and Barbara Wright. Famously they’re known as a sort of alternate continuity of the Doctor. Inside Tardis, and hello, Ian! I had wanted to see this film for years, and (courtesy of a great Christmas gift from my amazing girlfriend) last night I had the chance. It was a surreal experience; it’s just similar enough to The Daleks to feel familiar, but just different enough to catch you off guard on occasion. Some obvious differences: This “Dr. Who” is no alien, but rather a human, a mad scientist type whose last name is literally “Who”. His Tardis—small letters—is a ship called “Tardis”, and it is no acronym. The ship itself is vastly different inside from that depicted on the small screen, though it is still dimensionally transcendental (if described somewhat differently). Barbara, here, is not a schoolteacher, but rather is one of Dr. Who’s granddaughters along with Susan, who is some years younger than the version played by Carol Anne Ford. Ian is Barbara’s boyfriend (perhaps presaging the relationship that had visibly begun to develop in their later appearances on the series, and that has since been more heavily developed in spinoff media). This film wouldn’t be out of place among the Disney family films of the era. You almost expect to see Mary Poppins arrive and start up a musical number at any moment. The Doctor is the somewhat-bumbling-but-grandfatherly paternal figure, and Susan fills out the precocious-child role. It’s the Daleks who save the film from Disney territory; they’re still frightening, and somehow more bloodthirsty than their early-series counterparts. I really had no complaints about them, except one: I commented that they were too easily pushed around by the humans, manhandled even. You would think that powerful death machines would be able to put on the brakes when shoved. Then again, even as I type this, I’m watching season ten’s Planet of the Daleks, and just saw a couple of Daleks get pushed into frozen pools. I guess some things never change. The Daleks’ enemies, the Thals, are overblown compared to their television counterparts: angelic faces, copper hair, gold eye shadow—it has the feel of a terrible drag show. If I was expecting Mary Poppins earlier, I’m expecting the Village People now. Still, I realize it was a different time, and the things that constituted innuendo would have been different then, so I’ll overlook it. It was harder to overlook Ian Chesterton, however; that character’s portrayal was the one truly disappointing thing here for me, as I like Ian as portrayed in the series. On television he’s the sixties’ ideal of a man’s man—confident, capable, strong, good in a fight, handsome. In this film, he’s a wuss. He alternates between whining, stumbling, and getting knocked out; and I couldn’t help wondering what Barbara sees in him. It’s not often I’ve rooted for a companion to die, but this was one of those times…alas, he survives. But I digress. I don’t want to give the impression that I hated the movie; on the contrary, it was a fun watch. In some ways, it even exceeds its television counterpart: you get more Daleks onscreen, and a pretty good destruction scene near the end. The moment when the Daleks ambush the Thals at the cliff outside the city is very impressive indeed, and is played out very differently from the series version. The addition of color to the film is a dubious benefit, given that the colors used are roughly equivalent to an Austin Powers film, but it was at least gratifying to see the Daleks in full color (in the series, you completely miss the notion that color signifies rank among the Daleks, at least for the first six years). You get a few laughs that are absent from the more serious television version—Ian having trouble with doors in the Dalek city makes for a decent sight gag. 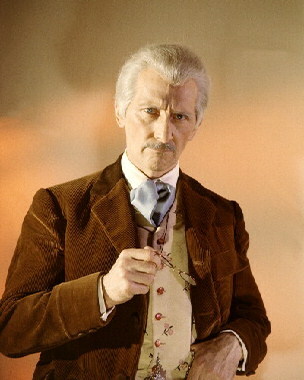 And of course, there is Peter Cushing’s great performance. Although his early lines are lackluster, that’s hardly his fault; and by the end of the film, he is the Doctor, as much as William Hartnell ever was. I was chiefly familiar with his career from his turn as Grand Moff Tarkin in Star Wars, which, while fantastic, is a completely different kind of role. He pulls off the eccentric, benevolent-but-mad scientist just as well (as anyone familiar with his history of Frankenstein films could probably have told me!). Of course this film isn’t canon; but you can see how it could have been. Thinking about this film, I can’t help thinking about the question of canon in general. It’s famously been said that Doctor Who is a show without canon; and if you poll any group of fans, you’ll get widely differing opinions on what constitutes canon in Doctor Who. Do we limit ourselves to the television series? Or do we allow other material? The novels, and if so, which ones? What about the comics? The Big Finish audio dramas? That controversial 1996 movie? Or—one of my personal favorites—the parodic Doctor Who and the Curse of Fatal Death? Where do you draw the line? I’m not in any way suggesting that this movie or its sequel should be canon. I am saying, as a fan, that they can be. There’s room for all the Doctors here. It’s not unusual for these things to become an argument, because if there’s one thing we science fiction fans can do, it’s argue. (And, let’s be clear, I’m all for debate—that’s half the fun!) But there’s no reason to let those arguments divide us. After all, when you boil it down, we’re all in this for the fun of it. Dr. Who and the Daleks, if nothing else, is a lot of fun. So, Whovians, what are you waiting for? Find a copy**, and check it out! You won’t be sorry. *The image above can be found at the creator’s DeviantArt page, here. **I am not endorsing Amazon.com as the only source for this material; it is simply the first vendor I found. Please feel free to do business with any vendor you prefer.